Focusing on speed, technique and endurance provides a solid workout for an advanced swimmer. As an advanced swimmer, you already have a solid swimming foundation and know all your strokes. Now you can focus on improving upon your technique, speed and endurance. At this level, you may be interested in competing in a swim meet, triathlon or simply continuing to challenge yourself to improve fitness. An advance drill for both freestyle and backstroke has you kicking on your side with one arm extended to maintain streamline body position for a count of six seconds. Then you complete three strokes to switch your body to face the other side and resume kicking. When doing this drill, focus on long strokes and maintain proper body position when kicking on your side. An advance butterfly swimming drill is one that features three kicks to every one pull. This drill is designed to help you focus on powering through the kick and recognizing your body position throughout the undulating motion of the stroke. 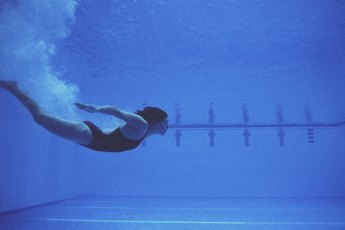 Having proper body roll and breathing technique is essential for speed and efficiency in the pool. When completed properly, both of these help reduce drag. One drill that works on both of these techniques is called the lungbuster because this drill gets steadily harder as it continues. While swimming freestyle, begin by breathing every third stroke, then increase to every fifth stroke. Continue to increase to the next odd number until you are breathing every ninth stroke, Then begin again at every third stroke and build back up to nine. Amanda Beard is a seven-time U.S. Olympic medalist and former world recorder holder in the 200-meter breaststroke. 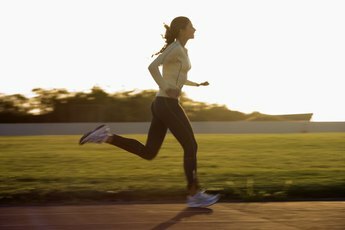 Her advance workout covers 6,000 yards and features a warmup, main set and cool down. To complete this workout, you will need a pull buoy and kickboard. For the warmup, begin with 400 yards of swimming followed by 300 yards kicking, 200 yards pulling and a 200-yard individual medley. In the main set, swim 16 100-yards by only kicking. Then swim three 100-yards freestyle, one 100-yards breaststroke, one 100-yards individual medley and one 100-yards easy in any stroke. Repeat this four times then swim 20 25-yards during which, on the odd laps, you aim not to take a breathe. For the cool down, swim 300 yards at an easy pace. Women’s Health Magazine designed a comprehensive three-day a week training plan to prepare advance swimmers for a race. In this plan, warm up every day with a 100-yard freestyle, 100-yard kick and eight 25-yard freestyle swims in which you switch between hard and easy laps every 25 yards. Take 15 seconds rest between each lap. Do this entire set twice. On day one, swim 300 yards easy followed by six 50-yard intervals at a moderate pace. Focus on technique and form and complete this set twice followed by a 100 yards easy cool down. On day two, do a pyramid swim in the order of 100-yard swims, 150-yards swim, 200-yards swim, 200-yards pull, 150-yards pull and 100-yards pull. Finish with a 100-yard cool down. On the third day, do a long swim of four to six 300-yard swims at a steady pace.